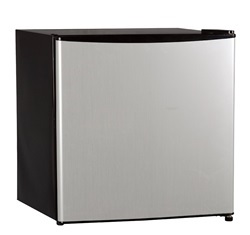 Looking for a small upright freezer for your tiny apartment, office, dorm room, RV or bedroom? Well, check out these 5 compact upright freezer bestsellers. By the way, 4 of the 5 freezers are certified as energy efficient and are a great option for keeping both food and energy costs low. Another striking similarity is that these are stainless steel freezer (either door, or both door and cabinet) so the color is clearly in vogue. It’s Energy Star certified, and therefore won’t needlessly run up your electricity bill. An adjustable thermostat is standard to all the Whynter 2.1 cu ft. models. This has a temperature range of -10° to 2°F, making it possible to easily switch from storing soft-serve ice cream to rock frozen meat and vice versa. It's a beautiful all-stainless steel freezer (door and cabinet) with black trimmings. 2 removable shelves make it easy to organize your storage space. What’s more, the shelves can be removed completely to create room for tall items. Its compact design makes it a great addition to tiny rooms or apartments where space is literally at a premium. A nice bonus is that you get free shipping if you select this option during the checkout process. Yes, the 3.1 cu. ft. EdgeStar fridge/freezer has edged its way into the No. 2 spot. This is probably because it offers all the benefits of a full sized refrigerator in a compact, attractive design. It offers the conveniences of a freezer and refrigerator in a single appliance so you don’t have to waste your precious money investing in both. It has a true zero degree freezer so you can be sure that it will freeze your food solid when you want it to. Door bins in both the freezer and refrigerator sections and slide out shelves in the refrigerator section make food organization easy. It has separate doors for the freezer and refrigerator compartments so you only open the compartment you need, letting the food in the other remain frozen or refrigerated under safe temperatures. Because it’s Energy Star rated, it’s energy efficient, making it a good choice for anybody who wants to rein in rising energy costs but also save the world’s fragile environment. In fact, because it uses a new, improved refrigerant, it’s more energy efficient than its predecessor model, the CRF320SS. It offers the priceless advantage of automatic defrost in the refrigerator section; although the freezer compartment will, unfortunately, have to be manually defrosted from time to time. The true stainless steel doors and black cabinet are bound to add a touch of style to any space. And, remember to choose the free shipping option during the check out process. The Midea WHS-52FB1 with a capacity of 1.1 cu. ft. is the smallest upright freezer on the market and is a good option if space is especially tight. It has mechanical controls with an adjustable thermostat and is ideal for you if you’re not wild about electronic controls. It’s energy efficient so it will not dent your electricity bill. Adjustable legs are a great leveling option if you have a slanting floor. The door is reversible and can either swing left or right, making placement in a tight space easier. A 2-year warranty on the compressor and a 1-year warranty on the rest of the appliance give you peace of mind that manufacturing defects will be remedied at zero cost to you. Plus, it's eligible for free delivery so no need to enter your zip code and hold your breath while the online calculator computes your shipping cost. 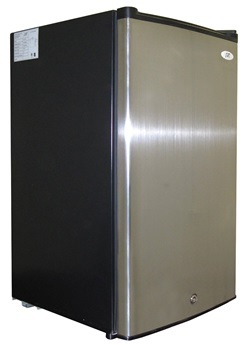 The SPT Energy Star upright freezer with a capacity of 3.0 cubic feet offers more than just a compact design. 3.0 cu. ft. net capacity provides plenty of room for one person or a small family. The lock and keys are a great way to secure your food investment. The 3 pull out baskets are great for food organization. The 2 top baskets measure 14.25" wide x 13.5" deep x 8.5" high while the bottom basket measures 14.25" wide x 13.5 " deep x 7.75" high so great for keeping your favorite Popsicle on hand. The mechanical thermostat helps you to adjust the temperature of your food as needed. A stainless steel door and a black cabinet make this freezer striking. The flush back design is a great space saver. This too is eligible for free shipping so there are no hidden costs. The SPT 2.1 Cu. 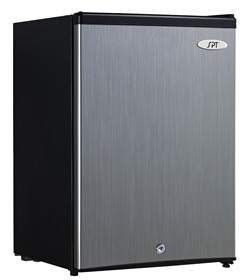 Ft. Energy Star Upright Freezer is another model that makes it to the mini upright freezer top 5 list. A 2.1 cu.ft. freezer capacity makes it easy to keep ice cubes and frozen treats handy. A lock and key keep sticky fingers out of your precious food but is also a great benefit for RV’ers as it will ensure that the freezer won’t swing open while you’re traveling. It has a true 0°F capability (especially in cool seasons and when the thermostat is at its maximum) making it a great asset if you plan to freeze your meats rock solid. The mechanical adjustable thermostat makes it easy to regulate the temperature of this upright freezer. 2 sturdy wire shelves make food organization easy. The compressor is very quiet and won’t intrude on your quiet space. The recessed handle is both a space saver but also adds a classy look to this small upright freezer. 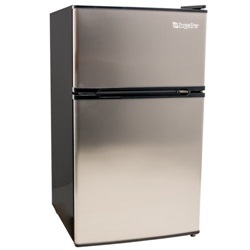 This freezer upright is eligible for free shipping, too. 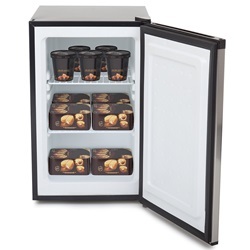 Compact upright freezers are great investments for small spaces. And because they are much tinier than large upright freezers, they are cheaper, too. So even if you’re on a tight budget, you are sure to find a small upright freezer that meets your needs. Go ahead and invest in one today.